Let Baby see art! Because newborns' can't focus clearly, they're most attracted to high-contrast and black-and-white visuals rather than the pastels that tend to dominate their surroundings. So instead of a pink sheep mobile, give your grandbaby something she can really get excited about. 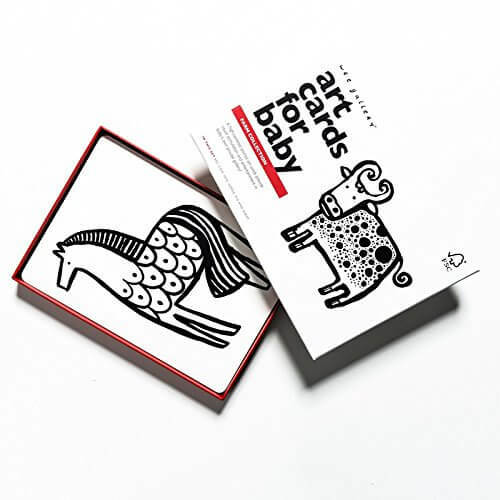 Wee Gallery makes inexpensive packs of hip, high-contrast flash cards in stunningly decorative animal designs (they deserve their name - "art cards"). Pair these with Wee Gallery's alligator-clip mobile so the parents can swap cards in and out as they wish, and Baby can watch her changing art gallery move in the breeze during the weeks to come. Strollers for grandparents. If you intend to spend much time out and about with your new grandchild, you'll need a stroller. Get ready for sticker shock! During the past decade, high-end companies have been upping the bells and whistles - and the price - on premium quality strollers, rolling out ever more adjustable, convertible and durable models. While celebs and their wannabes have been biting, extreme price doesn't necessarily equal extreme quality. Recently, some $1,000 strollers have been panned as being no better than their more more realistically priced competitors, so if you could care less which stars are pairing up with which brand and just need something practical and well-made, consider Summer Infant Lite Stroller. At a around $100 it has many of the same features as the high-priced models: a lightweight aluminum frame with ample padding for baby, a five-point harness, generous under-seat storage and attractive styling. Outfitted with adult-friendly goodies like cup holders and ergonomic handles, this model's best selling point beyond price is its compactness (it folds up umbrella-style), a top feature for anyone who's happy to have put the clutter of child-rearing behind them. The Summer Infant is good from birth through 56 pounds, making it a great long-range option. Bonus storage tip for tight spaces: The StrollAway lets you hang your stroller over a door, keeping it out of the way. Give the new parents a get-out-of-jail-free card. Doctors have been steadily whittling away at the recommended period infants should stay at home before being taken out into the world, but many parents still need time to let things settle before embarking on major outings. Your grandbaby's mom and dad have had 12 weeks - so this is the perfect time to rekindle their spirit of adventure with gear designed to make traveling with Baby a breeze. With any luck, they'll come and visit you. KidCo's Peapod infant travel bed is as cocooning as its name suggests. It offers a soft mattress, shelter from wind and UV rays and security - you can peek in from all angles - and it can be used as easily on outdoor day trips or picnics (a forest floor) as on overnight visits (a hotel room floor). Plus, it easily folds up into practically nothing for storage. Connect with your grandbaby. A growing number of parents are teaching their babies sign language so that the little ones can communicate their needs and desires (I'm hungry, I want my teddy) before they're physically able to speak. And more than a decade of research suggests that signing has a positive impact on infant development - not surprising, given that babies who can tell you what they want will have fewer tantrums and feel more in control of their environment. If your grandchild's parents are attracted to the idea of signing, your participation can allow you and the little one to develop a special bond. (If you talk to your grandbaby over a video-enabled Internet connection, try it there, too!) Several books and DVDs provide guidance in teaching signs, but the best book - and, arguably, the only resource you really need - is the one that started it all: Baby Signs: How To Talk With Your Baby Before Your Baby Can Talk. It's targeted to babies nine months and up, but infants as young as six months have shown that they can use simple signs to communicate if their caregivers start introducing them at around four months of age. A slumber aid for overnight grandbaby visits Helping your grandchild face nap time or bedtime at your house can be challenging, and the challenges can shift in intensity and character as toddlerhood approaches. Get a head start on any away-from-home toddler sleep issues - fear of the dark, trouble winding down - with a cleverly tech-driven plush animal from cloud b. The collection includes an aromatherapy doggie that releases a calming natural fragrance and a sheep that emits white noise, but the best of the bunch is the cozy Twilight Turtle, a combination night-light and stuffed animal. This fuzzy turtle not only glows reassuringly, but also projects softly glowing constellations onto Baby's walls and ceiling, turning itself off 45 minutes after the little one's head has hit the pillow. What's more, it comes with a guide to the stars so that as he grows, you can introduce your grandchild to the wonders of the night sky. Safety first with this long-life car seat. Your grandchild is likely to be transitioning from an infant car seat to a "convertible" one soon (convertible seats can be used in the rear-facing position required for older infants and then turned around when the child reaches the required height and weight), and a dizzying array of options is available. One manufacturer has taken a huge technological leap forward thanks to a new flagship model that rethinks what parents need from a long-lasting, reliable car seat. With its Diono Radian 3R All-in-One Convertible Car Seat, Diono has designed a convertible car seat with excellent crash test results, and it can be used from birth through not only the entirety of a child's car seat years, but even through the booster seat period - and the company has backed up claims with copious research data. In other words, this car seat is about as close as you come to a revolution in a safety-driven product area. And in addition to its eight-year lifespan, reasonable price for its features and stellar track record, the Radian 3R happens to be one of the most compactly folding car seats on the market, making it more manageable for air travel than most other car seats, despite being a bit heavier. This could be the only car seat/booster you ever need. Sounds like a good deal to us! The latest tools for eating and drinking. Is your grandbaby grasping objects firmly with his fist? Easily finding his mouth with his hand? Then he's probably ready for a sippy cup, which the American Academy of Family Physicians recommends that parents introduce around now. If you can remember the sippy cups of old, you'll remember the sticky mess they make, too. Modern versions still leak at least a small amount if left on their sides for an extended period, but green sprouts Glass Sip & Straw Cup does a pretty good job. Plus, since it's made of stainless –steel, it keeps drinks cold longer than any other one on the market, is virtually indestructible, and best of all, has a great ergonomic design for the youngest users. Come dinnertime, Beatrix Potter Peter Rabbit 5 Piece Melamine Dinnerware Set injects style (yes, classic style!). Give Baby a taste for natural fun. Maybe your kids grew up when plastic, battery-powered toys were the latest and greatest. But as anyone who has been watching the news of product-recalls knows, plastic toys can be here today and gone (back to the manufacturer) tomorrow. If you’re looking for a few long-lasting, safe and attractive toys to keep on hand for growing babies, take a cue from the trend towards natural, Earth-friendly toys. Brands like Under the Nile offer soft teethers as well as toys and dolls that will keep children company for years to come. A wooden rattle by Camden Rose or a brightly painted clutching toy by Haba can add a type of cheer and warmth that no injection-molded or battery-powered toy can match. For a bit of natural inspiration, books like Trees Make the Best Mobiles offer meditations on simplicity for parents and grandparents alike, and remind us that we teach our children not only with the things we provide but also with the physical and mental space we preserve for their growing minds, which can use the simplest plaything in a hundred ways. Introduce Mom and Dad to home-cooked baby food. After decades of decline among U.S. households, homemade baby food is making a strong comeback for a variety of reasons - among them are the nutritional value of fresh-made food, an increasing interest in organics, a desire to help prepare children’s palates for a wider variety of foods by offering less sweetened and more complex flavors, and concerns over the leaching of the potentially harmful chemical Bisphenol-A into processed baby food from jar lids. Young parents nervous about making "good" baby food might appreciate the So Easy Baby Food Kit by Fresh Baby, which includes a DVD, baby-food freezing trays with snap-on lids so Mom can easily thaw mini portions, and a book. Buy the trays alone for moms who have more cooking skills, or throw in the Baby Bistro Box recipe card set or Infaso Baby Food Maker - with this cool tool, the parents will soon be able to turn whatever they had for dinner into much for the baby. Help Baby do the soft-shoe shuffle. According to current thinking, as children begin working on walking skills, it's important to provide soft-soled shoes for outings and cold weather that allow their feet maximum surface contact and touch sensitivity - that's how they learn to balance and walk effectively. Robeez soft-soled leather shoes and arev a great option, offering excellent foot-to-floor contact for early walkers. Robeez fare somewhat better for outdoor excursions because of their increased padding for soft, human feet. They offer truly adorable designs that are even cuter than the hard-soled shoes baby isn't ready for yet! Birthday shopping? Give a classic A set of building blocks is still one of the best gifts for Baby's first birthday, and options abound. 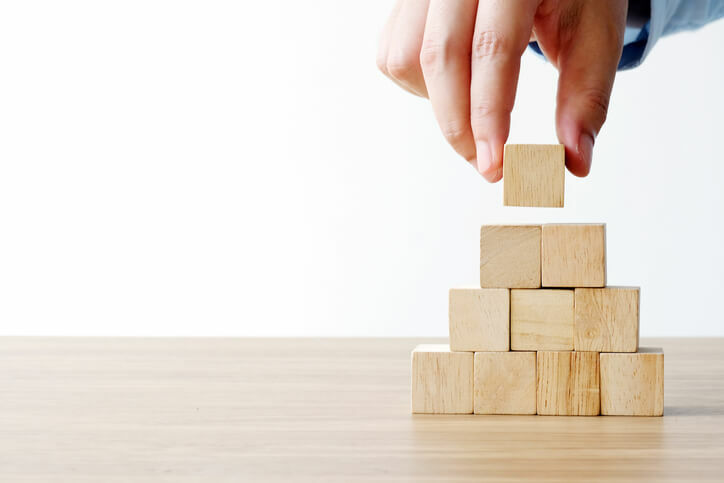 While some toy companies have launched innovations like plastic blocks with inner scenes or moving parts or soft blocks that double as rattles, mirrors, or squeakers, the best blocks for building are the classic wood variety. It’s important to buy a set that is rated for infant use; many wooden blocks are rated for children ages three and up because of the presence of pieces that could pose choking hazards. Haba, an innovator in many areas of wooden toy design, has a bright, beautiful set - Baby's First Blocks, that is painted with 100 percent nontoxic paint and made in Germany. In our search, Melissa and Doug also makes a great-looking set of infant blocks, sold in 50- and 100-piece sets. For a non classic set that's suggestive of Mega Bloks but easier for little hands to play with, check out Haba's wooden Fit Together StickiBlocks. Baby's old enough for kitchen work! Among a child's earliest impulses for pretend play is food prep. It makes sense: at this age they're exploring new foods and developing their palates, plus they're in mimic Mom mode. Grandparents looking for good toys that don't take up too much space might like ALEX Toys' retro-styled Wooden Cooktop Play Stove, an ultra-compact fold-up option that comes complete with pretend kitchen tools. If you're feeling crafty (and green) and have space, consider making a cute, recyclable cardboard play kitchen using crafter forty-two roads' inexpensive, downloadable instructions. Play food has come a long way in the last 10 to 15 years, with designs that engage children actively in working with food items, use more natural materials like wood and wool, and model healthier food choices than the largely advertising-driven play food of previous decades. Melissa and Doug's Cutting Food Box comes complete with segmented wooden fruit, vegetables and bread that can be cut into pieces with a wooden knife and cutting board. On the other end of the natural spectrum, artisan-designed play food from iPlay offer adorable wool felt pieces for homemade sandwiches and other "recipes" children can make by combining individual ingredients.